Exploring the Outdoor Classroom: Bike "Parking" Solution! 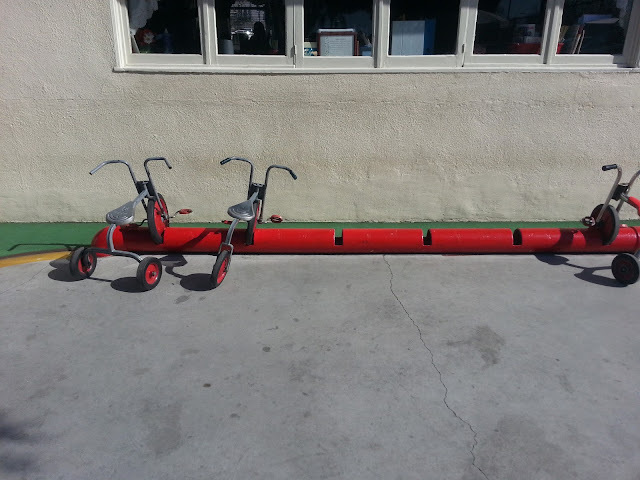 I was visiting a preschool the other day and I absolutely LOVED their creative idea for 'parking' their 2-wheel bikes. Currently, we battle the parking solution every day. Our creative Outdoor Curriculum Specialist marked off 'parking spaces' in red duct tape for the 3-wheelers. But the 2-wheelers tend to get dropped, flopped, and abandoned without much thought from our pint-sized riders. I must say, we will be creating this parking solution at our next site work day. The racks are simply a large round of PVC, painted red, and held down with curved PVC joints that were cemented to the concrete. Large slits were cut into the PVC to accomodate several front tires from the bikes. Love the simplicity of this idea, so good to see you back posting again, missed you! Thanks, Kierna! I've missed the blogging scene...it is good to be back! Students will be happy happy having it. I'd really like to contact the folk who created that idea, could I ask for the school name. I'm interested in creating the product here in the uk. I don't think I can give the name, however, this was so simply made by a large PVC pipe, painted red, and cut to make the wheel slots. They used PVC corner joints to stand it up on each edge, the filled the joints with concrete. They had some parents put it together for them.